WiFisher LLC works with traditional businesses to understand who their guests, visitors, clients, and customers are. We collect the data, group customers into specific categories, and analyse their behaviour. WiFisher LLC helps its client to know who their customers are, to know better how to reach out to them. WiFisher provides automated email marketing tools, or allows creating customized marketing messages. WiFisher’s platform is also perfect for advertisers as it allows choosing a venue, design creative campaigns, pay online, launch WiFi Ads, and monitoring its success instantly. WiFisher LLC may change this Policy from time to time so you should check it occasionally to ensure that you are happy with any changes. By using restaurant’s, bar’s, café’s and other venue’s (location’s) hotspot (Wifi) set up by WiFisher LLC, you are agreeing to be bound by this Policy. Any questions regarding this Policy and WiFisher LLC privacy practises should be sent by email to responsible person of WiFisher LLC. “WiFisher LLC” refers to the legal entity – limited company, including their partners, directors, professional and administrative staff, employees, self-employed or contract personnel. “Client(s)” – the existing or potential Client(s) of WiFisher. “Controller” means the natural or legal person, public authority, agency or other body which, alone or jointly with others, determines the purposes and means of the Processing of Personal Data. WiFisher is a Controller in relation to Data Subject’s Data. “Data Subject” – Client’s guests, visitors, Clients, customers, who signs-in to Client’s hotspot. “Data Subject’s Data” - are Personal Data related to current, former, or prospective Data Subjects that are collected, used or Processed by WiFisher. An exhaustive list of Data Subject’s Data is provided under Section 4. “Personal Data” means information about an identified or identifiable natural person. “Process”, “Processed” or “Processing” means any automated or manual operation performed on Personal Data, such as collection, recording, organization, structuring, storage, adaptation, alteration, retrieval, consultation, use, disclosure by transmission, dissemination or otherwise making available, alignment or combination, restriction, erasure, or destruction. Processing may use the equipment or facilities of WiFisher or a Third Party. “Processor” means a natural or legal person, public authority, agency or other body, which Processes Personal Data on behalf of the Controller. By default the WiFisher’s Processors are WiFisher approved vendors and IT service suppliers. “Profiling” means any form of automated Processing of personal data consisting of the use of personal data to evaluate certain personal aspects relating to a natural person, in particular to analyse or predict aspects concerning that natural person's personal preferences, interests, behaviour, location or movements. “Recipient” means a natural or legal person, public authority, agency or another body, to which the personal data are disclosed. Public authorities which may receive Personal Data in the framework of a particular inquiry in accordance with the law shall not be regarded as Recipients. “Third Party” means any individual or entity, including subcontractor, vendor, Client, provider of outsourced information Processing services, excluding the Client to whom the Data Subject’s Data relates. Our Data Protection Officer is Mr. Daviti Khosroshvili. You can contact our Data Protection Officer under dpo@wifisher.com or telephone number +995591229968. WiFisher collects uses and stores your Personal Data in accordance with the applicable Data Protection Legislation. Personal Data means any information relating to an identified or identifiable natural person. Below we inform you about the categories, extent and purpose of the collection and use of Personal Data. Your name, surname, email, Facebook ID, mobile number, MAC address, birth date, gender, age, hometown, current country, current city, liked pages, current position, locations, where you used Wifi set up by WiFisher, for marketing purposes, i.e. for sending to you promotional and advertising notifications and materials about different products and services of various business entities and organizations and statistical purposes, e.g. for getting statistics about your return rate/frequency at the venue. Your MAC address from WiFi Mac Address Mapper device for marketing and Processing / analytics purposes. The latter information is used for WiFisher to detect your location better as WiFi Mac Address Mapper is a Wifi access point to which mobile device sends its MAC address automatically, which is a general function of any smartphone. WiFi Mac Address Mapper receives MAC address from your mobile device, sends it to WiFisher’s server after which WiFisher’s server saves the MAC address in it’s database only in the case, if the Data Subject has previously logged into venue’s (location’s) hotspot (Wifi) set up by WiFisher and agreed to consent. After saving applicable MAC addresses in the database, WiFisher uses this information to deliver higher preciseness marketing and analytics tools as mentioned above. All mentioned data is obtained from you in the course of your log-in to Client’s (e.g. restaurants, bars, cafes, etc.) hotspot (Wifi) , set up by WiFisher or while being on the territory or nearby the client’s venue. The collection of the above-mentioned your data are collected only with your consent or when it is necessary for us to comply with our legal obligations or necessary for our (or others’) legitimate interest, including our interests in providing an innovative, relevant, safe, and profitable service to our clients unless those interests are overridden by your interests or fundamental rights and freedoms that require protection of Personal Data. You have the right to withdraw your consent at any time without affecting the lawfulness of Processing based on consent before its withdrawal by sending us a withdrawal request via email at: forgetme@wifisher.com . In accordance with Art. 6 (1) point (f) GDPR, our website uses so-called cookies in order to make available personalized functions and in order to analyze your use of our website. A cookie is a small file, which stores certain information about a user’s access device (PC, Tablet, Smartphone etc.) on such device. When such device accesses our server’s website, the server receives such cookies. The server can evaluate the information stored in the cookie by different methods. Cookies enable e.g. functionality of us remembering your choice of “remember me” to automatically log you into our management panel to make the service more comfortable for user. You may accept or disable cookies via your browser settings. However if you disable cookies you may potentially not be able to use all interactive functions of our website. For more information about the Processing of your Personal Data via cookies see our Cookies list below and the Section 4.3. We use the log data only in anonymized form (i.e. without any allocation to or indications about your person) for statistical analyses, e.g. [please indicate the examples of statistical analyses]. Moreover, the log files enable us to detect possible errors, e.g. faulty links or software bugs. Thus, we can use the log files for the further development of our webpages. We never associate the use and page impressions that are stored in the server log with individual persons. We reserve the right to use data from log files if certain facts give rise to the suspicion that users use our websites and/or our services in an unlawful or non-contractual way. In accordance with Art. 6 (1) point (f) GDPR, this website uses Google Analytics, a web analytics service provided by Google LLC (“Google”). Google uses mainly uses first-party cookies to report on user interactions on Google Analytics customers’ websites. The information generated by the cookie about your use of the website will normally be transmitted to and stored by Google Analytics on servers in the USA. Google Analytics uses IP addresses to provide and protect the security of the service, and to give website owners a sense of where in the world their users come from (also known as "IP geolocation"). A method known as IP masking gives website owners using Google Analytics the option to tell Google Analytics to use only a portion of an IP address, rather than the entire address, for geolocation. If you provide WiFisher Personal Data, i.e. name, surname, email, job title, mobile number by using our registration form in our website, you expressly give your consent that WiFisher may store and use this data for contacting you in the near future and for the Processing of your query. You have the right to withdraw your consent at any time without affecting the lawfulness of Processing based on consent before its withdrawal by sending us a withdrawal request via email at: forgetme@wifisher.com . WiFisher receives information, which contains Personal Data from you, when you log in to WiFisher’s set up WiFi access point by using Facebook, LinkedIn, Twitter, VKontakte, Odnoklassniki or other social media or manual registration with required and/or optional fields. We work with third-party service providers to help us operate, provide, improve, understand, customize, support, and market our and Clients’ services. For example, we work with Facebook in order to give you an additional option to log-in to venue’s (location’s) hotspot (Wifi) set up by WiFisher and provide WiFisher with the needed information. Disclose and transmit the Personal Data to the administrator or owner of the venue, where you have connected to the WiFi Internet network, so that the administrator or owner of the venue has an opportunity to send to you promotional and advertising notifications and materials about its products and/or services. WiFisher uses technological and organizational security measures in order to protect your data from accidental or deliberate loss or destruction or access by unauthorized persons. Our security measures are constantly being adapted to technological development. WiFisher uses only Processors providing sufficient guarantees to implement appropriate technical and organisational measures in such a manner that Processing will meet the applicable data protection requirements and ensure the protection of the rights of the Data Subject. Processors Processes the Personal Data only on documented instructions from the WiFisher. WiFisher shall provide information on action taken on a request under Articles 15 to 22 of GDPR to the Data Subject without undue delay and in any event within one month of receipt of the request. That period may be extended by two further months where necessary, taking into account the complexity and number of the requests. Please note that where WiFisher has reasonable doubts concerning the identity of the natural person making the request referred to in Articles 15 to 21 of GDPR, WiFisher may request the provision of additional information necessary to confirm the identity of the Data Subject. According to Art. 21 (1) GDPR, the Data Subject shall also have the right to object, on grounds relating to his or her particular situation, at any time to Processing of Personal Data concerning him or her which is based on point (e) or (f) of Art. 6 (1) GDPR including Profiling based on those provisions. WiFisher shall comply with the aforementioned requests if and to the extent such compliance is required by the applicable statutory laws. Where Personal Data are Processed for direct marketing purposes (for example sending e-mails or SMS for marketing purposes), according to Art. 21 (2) GDPR, the Data Subject shall have the right to object at any time to Processing of Personal Data concerning him or her for such marketing, which includes Profiling to the extent that it is related to such direct marketing. More information about the procedure of data subject request, can be found in Data Subject Requests Procedure. We Process and store Personal Data only for the period, which is required to meet the purpose of Processing, or as long and to the extent as statutory laws require us to Process and/or store such data. If the purpose of Processing does not apply anymore and the applicable statutory retention requirement expires, we will as a matter of routine erase data or restrict the Processing of data in accordance with the applicable statutory laws. This cookie is used to detect your visit to the web-page. Up until you clear your cookies. This cookie is used to remember your choice of “remember me” on the log-in page to automatically log you into our management panel. Further information about each of the above Rights can be found in Section 5 of this procedure. Each of the rights involved has its own specific aspects and challenges to WiFisher in complying with them and doing so within the required timescales. In general, a proactive approach will be taken that places as much control over personal data in the hands of the Data Subjects as possible, with a minimum amount of intervention or involvement required on the part of WiFisher. This may be achieved by providing online access to the personal data so that the Data Subject can verify and amend it as required. It should be noted that Data Subjects can make such requests verbally (for example over the telephone), as well as in an email or postal letter by filling out the Data Subject’s request form (Annex 1). However, in some cases, there is a decision-making process to be followed by WiFisher regarding whether a request will be allowed or not; where this is the case, the steps involved in these decisions are explained in this document. “Data Controller” has the meaning specified for “controller” in the GDPR. “Data Subject” has the meaning specified for “data subject” in the GDPR. “Personal Data” (“Data”) has the meaning specified for “personal data” in the GDPR. “Processing” has the meaning specified for “processing” in the GDPR. “Personnel” means any employee, other authorised staff and/or external contractor with access to Confidential Information. All WiFisher’s Personnel have a responsibility to recognize a request and to comply with the procedure as follows. 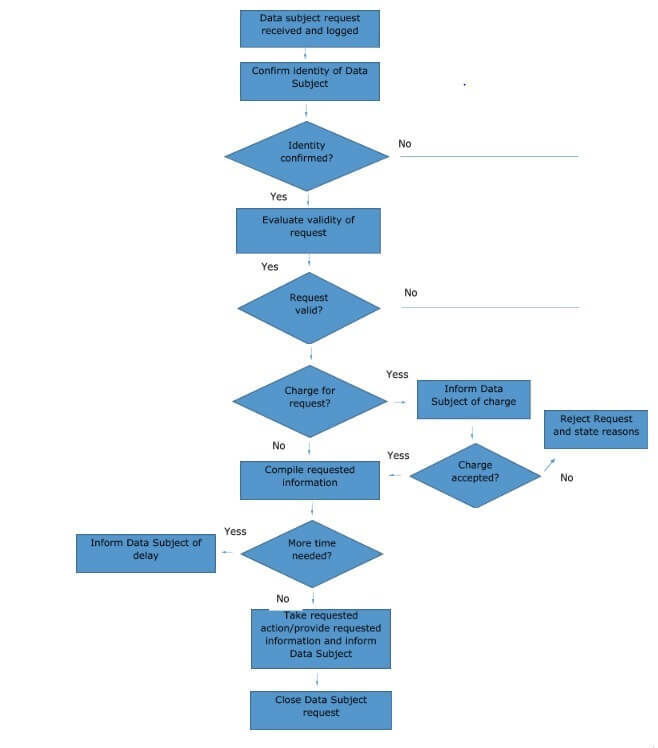 The procedure for responding to requests from Data Subjects is set-out in sections 4.2 Procedure Flowchart and expanded in 4.3 Procedure steps. The specifics of each step in the procedure will vary according to the type of request involved – refer to the relevant section of this procedure for more detail. 1. Data subject request received and logged – the Data Subject submits a request via one of a number of methods, including via e-mail, by letter or on the telephone. If request is received not by Data Protection Officer, the received request must be passed to the WiFisher’s Data Protection Officer immediately. Please note that it is important that you obtain some basic details about the request, such as the time frame, whether it is in relation to a particular event or time / activity as this can help to provide the correct information required in a timely manner before forwarding the request to the Data Protection Officer for action. The request must be forwarded to [dpo@wifisher.com]. If the request was made over the phone then as much information as possible regarding what was requested must be typed into an email and sent to the Data Protection Officer immediately. If the request is received in a postal letter, this can either be scanned and sent to the Data Protection Officer by email, or the hardcopy taken to the Data Protection office immediately. The Data Protection Officer will process the request accordingly and respond to the Data Subject in line with the legislation. They may ask for input and/or provision of data from teams across the WiFisher in order to ensure they have fully complied with the request. Due to the time limits for complying, teams requested to assist should treat such requests as a priority. The fact that the request has been received is logged in the Data Subject Request Register and the date of the request recorded. 2. Confirm identity of Data Subject – the identity of the Data Subject is confirmed via an approved method. More information may be requested to confirm identity if required. If the identity of the Data Subject cannot be confirmed, the request is rejected and the reason for this communicated to the Data Subject. 3. Evaluate validity of request – the test of whether the request is manifestly unfounded or excessive is applied. If so, a decision is made whether to reject the request or apply a charge to in. In the case of requests for rectification, erasure, restriction of, or objection to, processing, a decision is also taken about whether the request is reasonable and lawful. If not, the request is rejected and the Data Subject is informed of the decision and their right to complain to the supervisory authority. A Data Protection Officer must be involved in this step. 4. Charge for request – if a charge is applied, the Data Subject is informed of the charge and has an opportunity to decide whether or not to proceed. If the Data Subject decides not to proceed, the request is rejected and the reasons communicated. A Data Protection Officer must be involved in this step. 5. Compile requested information – the relevant information is compiled according to the type of request. This may involve planning how to requested action, e.g. erasure or restriction of processing, will be achieved. A maximum of one month is permitted; if the request will take longer, a maximum of two further months are allowed ant the Data Subject must be informed of the delay and the reasons for it within one month of the request being submitted. A Data Protection Officer must be involved in this step. 6. Take requested action/provide requested information and inform Data Subject – the requested action is carried out (if applicable) and the information requested is provided to the data subject electronically or via other means. Data Subject is informed about the actions taken to implement its rights. 7. Close Data Subject request – the fact that the request has been responded to is logged in the Data Subject Request Register, together with the date of closure. The Data Subject has the right to withdraw consent where the basis for processing of their Personal Data is that of consent (i.e. the Processing is not based on a different justification allowed by the GDPR such as contractual or legal obligation). Before excluding the Data Subject’s Personal Data from Processing, it must be confirmed that consent is indeed the basis of the Processing. If not, then the request may be rejected on the grounds that the Processing does not require the Data Subject’s consent. Otherwise, the request should be allowed. In many cases, the giving and withdrawal of consent will be available electronically, i.e. online, and this procedure will not be required. Where consent involves a child (defined by the GDPR as age 16+ unless changed by law in individual member stated) the giving or withdrawal must be authorized by the holder of parental responsibility over the child. A Data Subject has the right to obtain confirmation from WiFisher whether their data is being process, to obtain access to their Personal Data and other supplementary information. In most cases, the decision-making process for such request will be straightforward unless it is judged that the request is manifestly unfounded or excessive. Right of access requests must be responded to within one month. Data Subjects are entitled to have their Personal Data rectified if it is inaccurate or incomplete. If the information in question has been disclosed to a third party WiFisher must inform them of the request for rectification where possible. The Data Subject is also entitled to be informed of the third parties to whom the data has been disclosed, where appropriate. Where necessary, WiFisher will take steps to validate the information provided by the Data Subjects to ensure that it is accurate before amending it. Rights to rectification must be responded to within one month. Reasonable efforts must be made to ensure where the Personal Data has been made public. It is likely that such decision will be require the involvement of the Wifisher’s Data Protection Officer and in some cases senior management. When a Data Subject objects to Processing which is being carried out for the reason of performance of a task in the public interest, or for the legitimate interests of us, then we must restrict processing to storage only whilst we consider whether our legitimate grounds override the Rights and freedoms of the individual. When we no longer needs the Personal Data but the Data Subject requires it for the purpose of a legal claim. Wifisher will need to make a decision on each case of such requests as to whether the request should be allowed. It is likely that such decision will be require the involvement of the Wifisher’s Data Protection Officer and in some cases senior management. Where a restriction of processing is in place, the Personal Data may be stored but not processed without the Data Subject’s consent, unless for legal reasons (Data Subject must be informed). Other organisations who may process the data on our behalf must also be informed of the restriction. Restricted information about the individual may be retained to ensure that the restriction is respected in the future. The Data Subject has the right to request that their Personal Data be provided to them in a structured, commonly-used and machine-readable format, e.g. Excel or CSV file (GDPR Article 20) and to transfer that data to another party, e.g. service provider. This applies to Personal Data which processing is based on the data subject’s consent and the processing is carried out by automated means. Where feasible, the Data Subject can also request that the Personal Data be transferred directly from our systems to those of another provider. For services that come under this category, little decision-making is required for each case and it is highly desirable that this process is automated in its execution. For the purposes of scientific/historical research and statistics, unless the Processing is necessary for the performance of a task carried out for reasons of public interest. Once an objection has been made, WiFisher must justify such Processing by demonstrating compelling legitimate grounds for the processing which override the interests, rights and freedoms of the Data Subject or for the establishment, exercise or defence of legal claims and suspend Processing until this is done. Where the Personal Data is used for direct marketing we have no choice but to no longer process the data. The Data Subject has the right not be the subject of automated decision-making where the decision has a significant effect on them, and can insist on human intervention where appropriate. The Data Subject also has the right to express their point of view and contest decisions. In assessing these types of request, a judgement needs to be made about whether the above exceptions apply in the particular case in question. I, [name, surname], certify that the information provided on this application to the WiFisher LLC is true. I understand that it is necessary for the WiFisher LLC to confirm the Data Subject’s identity and that it may be necessary for the WiFisher LLC to request more details from me in order to be able to locate the correct information. Don’t wait any longer, join us now!